Can you imagine how your house could integrate itself into your daily life? The Nexo automation system won’t be only an integration in your home, it is the new standard in your life! Nexwell prepared intelligent business solutions, which can be found in conference rooms, hotels, office buildings and production plants. Flats or apartments equipped with the Fox automation system offer comfort, mobility, safety and savings. All manipulators are created considering one homogeneous style with highest quality. Each device is made of black or white Optiwhite glass. All glasses have 18 characteristic eight millimetre grindings. 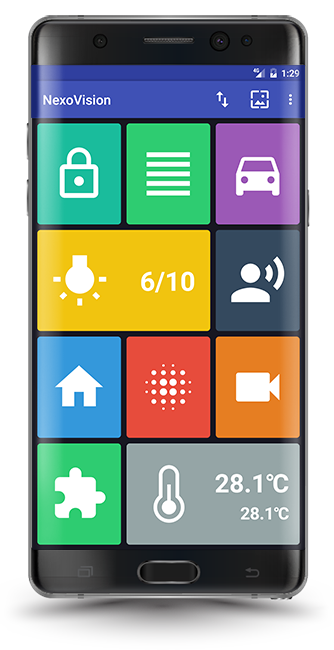 The readable and clear structure of the user interface allows you to control the whole building with your thumb. Using colourful tiles for identification provides an easy recognition of the various functions while also maintaining aesthetic. Arming and disarming the alarm system in the building. Have a look on the partition state. Keep control of fire protection and flood warning. Control the lighting of dimmable light bulbs, LED, RGB, and On / Off. The large and readable information about how many circuits are enclosed in the building at that time. Lower the blind, turn on the light, create a scene or check the temperature in a selected location in the house. Add the GPS location of the building, and the system will recognise when you're at home and when you're at work. Run valves, plug sockets and pumps through the relay menu. Control blinds, groups of blinds and awnings. Up, down, stop. Regulate the slat angle of electric blinds. Control earlier prepared programs. Run them from anywhere on the earth. Control entrance gates and garage doors. The information on closing or opening of the gates are available by the magnetic sensor installed in the ground. Video phone interface allows working with Nexwell IP video phone. Possibility of receiving audio/video calls. Loudspeaker operation mode. Watch your home from the inside and outside while you are at work, on delegation or vacation. Set the thermostats in the rooms. Find out what the temperature is inside or outside. Control recuperation, ventilation or air conditioning. The Fox and Nexo systems are convenience for all budgets. Check it out!